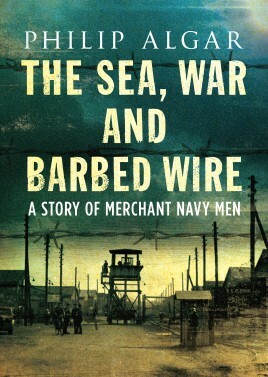 This is about the British Merchant Navy prisoners-of-war and is partly based on contemporary diaries hidden from the Germans. Other aspects of the war discussed include the activities of the German navy, the role of the BBC, how the prisoners knew what was happening in the war, the Nuremberg trials and the human cost of the conflict. This is the fascinating story of Captain Stanley Algar, an oil tanker master. Captured in the Atlantic, he and his colleagues spent four years behind barbed wire. This book, partly based on his diaries, hidden from the Germans, tells how the prisoners survived, confronted starvation and reacted to camp life and German propaganda. A graphic account of their liberation, written as it happened, is included. The role of the U boats and the merchant raider vessels and their commanders is discussed. Why, initially, were they so successful? Many other aspects of the war, including the role of the BBC, the German attempt to persuade some prisoners to change sides and enemy propaganda, are considered. How did the prisoners know what was happening in the war and why was their information so accurate? What was their relationship with the guards? What correspondence with home was allowed? There is a discussion of the Nuremberg trials and the appalling cost of the war. Finally, there are many pen portraits of international leaders and ‘ordinary’ men propelled into another conflict so soon after the war to end all wars had been concluded. Philip Algar, initially an economist, was subsequently a freelance broadcaster, lecturer, editor and journalist for 23 years. He has been a regular contributor to newspapers and magazines in Europe and the United States, writing about energy, business, economics, international politics and crisis management. Algar has worked in 30 countries. He has written 12 books, including three on crisis management, three satirical novels on contemporary life, two on aspects of the Second World War and one on an independent’s attempt to win a parliamentary seat in 2015.